It is a magical moment when a trout perceives a floating mayfly on the surface, whether a natural or an imitation. All of its lifelong learning experiences with ambushing prey and watching its biological world unfold daily will all boil down to just a few seconds as it decides to accept or reject a fly. The selectivity phases in this book will better help you understand what is going through the trout’s mind in these breathtaking moments. The best instructional fishing writing has always been, in my mind, an act of metaphysics, the best authors metaphysicians determined to bring us one step closer to inhabiting the consciousness of our quarry. That quality of transcendence is at the heart of fly fishing, so much so that I can imagine next-millenia anthropologists describing our lot as a group of people hell bent on shape-shifting into other life forms, be those the fish we pursue or the bugs and baitfish we tie to pursue them. Matt Supinski is modern fly fishing’s latest standard-bearer to that tradition of metaphysical writing that includes Gary LaFontaine, Vince Marinaro, Theodore Gordon and G.E.M Skues. In a time when so much how-to writing focuses on our relationship with gear, his new book Selectivity is one of those rare incursions into the very mind of a fish, in this case, trout, salmon and steelhead. Like a river, it gathers together a great many observations from a great many places–Europe, New Zealand, South America, North America–achieving a geographical breadth and depth commensurate with the angling ideas it advances. 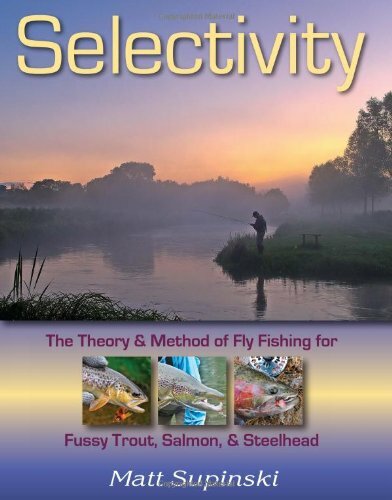 To sum it up in a paragraph, Selectivity represents Supinski’s life-long attempt to understand trout, steelhead and salmon behavior based on a theory of selectivity involving three phases: Aggressive/Active, Selective/Reflective/ and Passive/Dormant. To quote the author: The three stages all have unique, yet consistent behaviors, and each salmonid species’ behavior in these selectivity phases is influenced by its environment, evolution, and innate and learned behavioral experiences. The next two hundred pages see his argument elaborated upon in meticulous and convincing fashion, with evidence drawn from his decades as a guide in Michigan as well as his travels all over the watery world. I’m not sure what the litmus test of piscatorial scholarship is, but I’ll hazard one: if a theory helps you understand not only your past failures but your past successes, and helps you develop new and more imaginative ways to catch those fish that have been eluding you for years (I’ve got a few rivers in mind), then that theory is a winner. Supinski’s writing is an invitation to do just that. 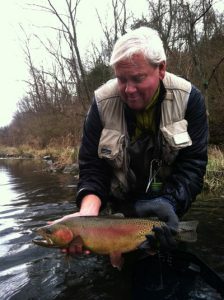 Supinski with a wild Pennsylvania rainbow. For months I probed and stuck my nose in every possible undercut bank, logjam, woody tree stump and bridge abutment. Mr. Big was nowhere to be found. One day I left the rod in the car and went hunting without it. If you are a trophy hunter, the worst thing to have in your hand is a fly rod. It will only distract you. I did take along a wading staff as I went to look for Mr. Big’s home den. My poking around turned up some nice Letort brown trout, but no Mr. Big. But there was one more stump and undercut bank that was yet to be explored. It was a big old oak tree stump with roots in the undercut bank that were collecting tons of surface debris in a backwater eddy. I stood up on the rotting roots overhanging the water and one leg crashed through the roots and down into the creek. I thought I had broken my ankle. Just then, Mr. Big came flying out of that stump and circled around three times in the main chanenel. As I moved away, he went right back to his home. It was time to plot the attack. This is a book worth reading because it reminds us of what books, when done right, do so well: present not just data but an overarching idea that helps us make sense of all that data, and put it to meaningful use. Throughout its pages, Selectivity provides an overview of the best fishing thinking of the past 150 or so years, much of it found in books (as opposed to magazines or this here Internet). I think of Selectivity (to use a river metaphor) as a delta of sorts, one that empties many streams and branches of fishing literature right into your lap. It does it so well I’ve got a hunch a few readers will find themselves drawn to visit or revisit some of fly fishing literature’s tributaries and upper reaches, with some bushwhacking all the way upstream to dame Juliana Berners. Can I say that this book will make you a better angler? Not without seeing your fly box or your mending skills. But what it will do, like so many of the great books it builds from, is make you a richer, more imaginative, and more observant angler. And isn’t that really what this obsession with fish and flies is all about? Figuring out the next piece of the puzzle? In the light it sheds on those mysterious below-the-surface activities, Selectivity represents another step forward to our shared effort to better comprehend that pea-sized trutta brain we’ve been collectively worrying over for centuries. May we have the chance to keep it up for several centuries more. Selectivity is published by Headwater Books.